Samsung is set to debut the fifth iteration of the generously-sized Note later this month, but this is the internet—why wait in patience, when we can piece together rumors and half-truths instead? Here’s everything we think we know. The Galaxy Note has long been the trend-setting Big Android Smartphone: Samsung basically invented (don’t-call-’em) phablets when it launched the first 5.3” Note back in 2011. Since then, screens have been getting oh-so-much bigger. Other companies have copied the Note’s styling (and occasionally, its stylus), but Samsung continues to rule the roost, selling nearly 5 million Note 4s in the month after its launch last year. But that doesn’t mean the Note 5 is guaranteed to be a smash hit: Samsung has lost dominance in India and China, and the emergence of cheaper but similarly-sized devices like the OnePlus 2 is putting Samsung under threat. Add all that together, and the Note 5 is an important device, both for Samsung’s reputation, and its diminishing coffers. Samsung has traditionally followed a predictably boring pattern for Note launches: the device gets announced around the IFA trade show in September, and muscles its way onto shelves by the end of the month. This year, things are changing a little: Samsung’s announcement event is August 13th. You can bet every shiny internet penny that the new Note will be on shelves before Apple announces its next iPhone sometime in September. Previous Notes have been available on all four carriers, and (reasonably believable) rumors say that trend will continue. 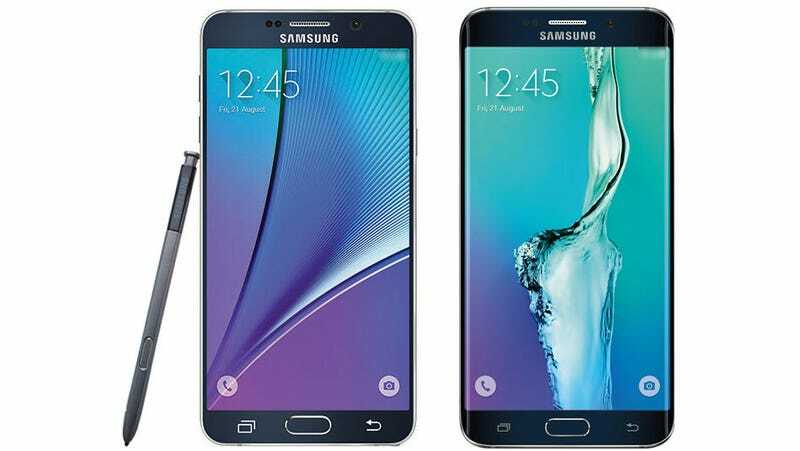 The Note 5 has been getting the leak treatment pretty hard and heavy, so we’ve got a fairly good idea of what it will probably look like: a big Galaxy S6. That means a glass-and-metal construction, curved back, and no removable battery or microSD. That’s the design suggested by numerous leaks of renders, and even some claimed hands-on photos of the device in the wild. That would be a major departure from tradition: previous Notes have rocked a faux leather back as part of Sammy’s longstanding plot to get you to trade your Moleskin for a Note. The stylus is still there, though, and this time round it’s apparently spring-loaded, to help you whip it out and start note-taking with zero delay. One change you might hope for is a USB Type-C port to replace the microUSB, but from the looks of these photos, Samsung will be playing it safe. The 5.7-inch screen on the previous few Notes has proved to be a popular style, and it looks like Samsung isn’t fixing what ain’t broke: you can expect the Note 5 to stick with that size. The 2560 x 1440 Super AMOLED screen on the Note 4 captured our hearts in a big way last year: Eric Limer described it as “a screen that will make people stop, stare, and ask delightfully ego-boosting questions”. A resolution upgrade from that screen would be pointless, so it’s no surprise that the Note 5 is rumored to stick with the same resolution, and almost undoubtedly with the Super AMOLED technology Samsung has favored for years. It’s possible that there have been some minor tweaks to improve color, brightness or battery life, though. You can expect the same 16MP camera packed into the Galaxy S6 to make an appearance in the Note 5. That’s a Good Thing: the S6 took the all-around crown in our Smartphone Camera comparison, giving the best balance of color and detail. There’s room for Samsung to improve with things like focus, flash and metering on the Note 5. Up front, there’s a 5MP camera that looks perfectly adequate for your awful selfies. But there’s some bad news on the battery: where the Note 4 packed a 3,200mAh battery, the Note 5 might shrink that down to 3,000. In real-world terms, that doesn’t necessarily mean a decrease in battery life: if the screen stays the same, and the processor proves less power-hungry in the Note 5, battery life might stay the same, or even get a tad better. The Note 4’s battery life isn’t a bad starting point, either: you can eke out two days of use with some care. But you know what’s better than two-day battery life? Three-day, or four-day battery life. Let’s make those batteries bigger, not smaller. According to a leaked specs sheet from AnTuTu, the Note 5 will be running Android 5.1.1. Undoubtedly, Samsung’s TouchWiz UI will run on top—not quite such a bad thing these days, since the bloatware is being minimized, and TouchWiz adds some features that make the most of the big screen, like split-screen apps, one-handed mode, or the Air Command interaction with the stylus. Those same leaked photos show some of the Air Command screens, and it looks like you can customize some of the actions. Let’s hope that customization has spread across the whole OS. Previous versions of the Note have come in two versions, one with Samsung’s own-brand Exynos processors, and the other with a Qualcomm Snapdragon. There’s a good chance this trend might end this year: Qualcomm’s top-of-the-line Snapdragon 810 has been plagued with overheating issues, and Samsung has been getting better and better at making its own chips (and, crucially, the wireless modems that are built into them). The Galaxy S6 shipped with an Exynos processor, and it looks like the Note 5 will too. A leaked benchmark from AnTuTu adds credence to the Exynos-only rumor, and also gives us some numbers for performance: a score of 69,702 points, beating out the S6’s 67,520 points, and every other Android smartphone for that matter. That same leaked benchmark also tells us about the other internals: 4GB of RAM, 32/64/128GB of storage, and a Mali-T760 GPU. Noticeably absent is a microSD slot. Samsung purged the removable battery and microSD slot from the flagship S6, so it’s no surprise to see them going from the Note series. Still, those were features beloved by a whole legion of Samsung fans; it’s sad to see them go in the (presumed) quest for slimness. The price has been spared any leaks so far, but Samsung (and top-end phones in general) tend to be consistent: around $300 on-contract, or $700-800 if bought without.